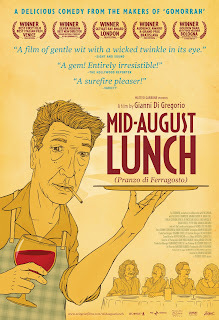 The US advertising art for Gianni Di Gregorio's Mid-August Lunch incongruously proclaims that it is "a delicious comedy from the makers of Gomorrah!" It seems like a strange match, using the name of a violent, true life mob drama to entice people into seeing a light hearted jaunt like Mid-August Lunch, but the point, of course, is the prestige. Gomorrah director Matteo Garrone is the producer of Mid-August Lunch, but you would be hard pressed to find two more disparate films. Mid-August Lunch the very definition of charming; miles away from the stark violence of Gomorrah. It is a beguiling, cheerful tale of a middle aged man taking care of four elderly women for an evening, with humorous results. Gianni Di Gregorio acts as writer, director, and star, filling the lead role of Gianni, who lives with his good hearted but often overbearing 93 year old mother in a rickety old apartment, reading her bedtime stories and cooking her meals and generally taking care of her every need. A scene from MID-AUGUST LUNCH. A film by Gianni Di Gregorio. He is also deep in debt, and facing eviction if he can't make rent. With the board of directors breathing down his neck, the building managers offers to help Gianni out if he will take care of his mother during the Pranzo di Ferragosto, the Feast of the Assumption, one of Italy's biggest holidays. He agrees, but when the manager arrives with his elderly aunt in tow as well, he gets more than he bargained for. His problem is compounded when his doctor asks for a similar favor with his own mother. Soon, Gianni is playing host to four elderly women, each with their own quirks and needs, as he tries desperately to keep them all happy and out of trouble. At only 75 minutes long, Mid-August Lunch may seem like a trifle, but that is exactly the point. Di Gregorio's assured direction and droll sense of humor make for an extremely pleasurable viewing experience. His cast of senior citizens are a hoot, a completely lovable and entertaining bunch with a penchant for nagging and awkward bluntness. There's a refreshingly old fashioned sense of timing at work here. This is character based comedy without jokes or punchlines, but filled with a sparkling dry wit that arises from the situations themselves. Gianni almost resembles Buster Keaton, with his hangdog, world weary charm, just trying to keep up with four fiesty old women. There is charm in its simplicity, a laid back joyfulness that hits the spot with the kind of zesty brevity suggested by its title. Mid-August Lunch is a wholly enchanting confection of a movie, a fresh, jaunty comedy arriving in the US just in time for Spring. It is the kind of film whose warm-heartedness is completely infectious, as crisp and bracing as a glass of champagne on a warm summer evening, going down easy and hitting all the right notes along the way. 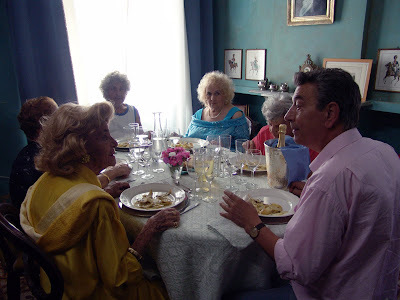 MID-AUGUST LUNCH; Directed by Gianni Di Gregorio; Stars Gianni Di Gregorio, Valeria de Franciscis, Grazia Cesarini Sforza, Marina Cacciotti, Maria Cali; Not Rated; In Italian w/English subtitles. On "How to Train Your Dragon"
Review: "The Sun Behind the Clouds"
Review: "The Girl with the Dragon Tattoo"
Review: "The Secret of Kells"